With Ben Hennessy. SOMA Contemporary Gallery, every Wednesday 16th March – 8th June, 7-9.30. A unique 12 week course offering a hands-on painting experience. Each week will feature one Artist with participants making a group painting of an iconic work. The artists featured will include Wassily Kandinsky, Pablo Picasso, Piet Mondrian, Paul Klee, Joan Miro, Jackson Pollock, Mark Rothko, William de Kooning, Antonio Tapies, Frank Stella and Sean Scully. All materials provided, limited numbers available. 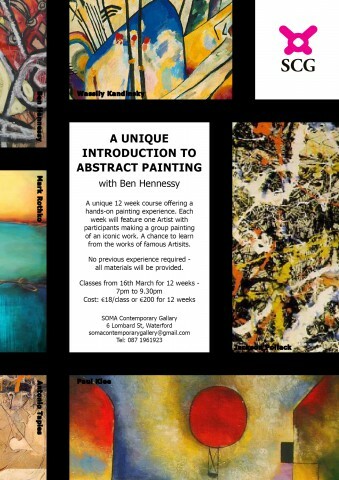 Ben Hennessy has been painting for over 30 years and has exhibited throughout Ireland, in London, San Francisco and New York. His work is included in many private and public collections. €18 per class or €200 for all 12 classes, payable on the evening. This entry was posted on April 19, 2016 by waterfordarts in Art and tagged art classes soma, art classes waterford, Ben Hennessy, Soma Contemporary Gallery.